By and large, poor nations still rely on the natural sources of water, creeks and rivers for all their water needs, be it bathing, washing of clothes, or harvesting in buckets to take home for cooking and drinking. They do so at great risk because the very same waters can be the source of viruses, bacteria, worms, parasites which cause disease in humans. 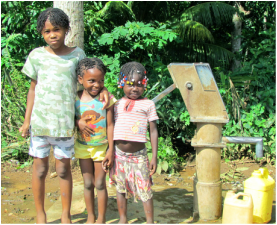 The Ford Foundation has installed and now maintains more than 30 wells in Grison-Garde and the surrounding area. In addition, we provide 60,000 Aqua Tabs (water purification tablets) each year to local families in need. The Ford Foundation supports multiple medical clinics in the Grison-Garde area. 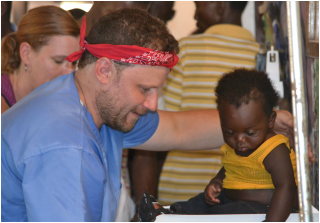 The Tovar Clinic, staffed by volunteers of the Haiti Mission four times each year, is staffed on a consistent basis by a Haitian physician, whose salary is provided by the Foundation. In addition, a clinic initially built by the Haitian government is now supported by the Foundation, which not only pays the staff but also installed a well for clinic use. An extension of these efforts, health education provided at these clinics and beyond has had a significant impact on the health of the entire community. In fact, Grison-Garde has one of the lowest incidences of cholera in Haiti. In Haiti, soccer is played on sandy, rocky soil with a ball that is often half inflated and ripped at the seams. But the game goes on, nonetheless. It's a much-needed diversion for kids who struggle with the day-to-day burdens of poverty. 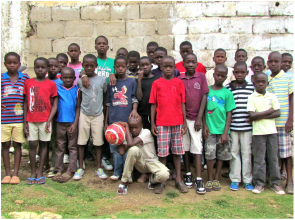 In 2012, a college student and former resident of our orphanage, Michael Bazile, came to us with a request to support three soccer teams made up of local boys ages seven to 18. They had a coach — they just needed the supplies to outfit the teams. The Ford Foundation has provided uniforms, balls, as well as used cleats donated from youth soccer players in the U.S., and we are working to develop partnerships with other organizations that would allow us to expand this effort. Over the last 20 years of our medical experience offering primary care in rural deeply impoverished Haiti, there have been significant changes for the better. Wells are more available, general nutrition has improved and immunizations have eliminated some serious diseases such as measles, polio and meningitis. Infantile diarrhea and dehydration, the scourge of the past, is now uncommon. The list goes on and on. One sad and devastating problem seems as prevalent and malicious as ever: maternal/neonatal death at or following delivery. there are absolutely no reliable statistics in this regard — most births occur in huts or homes in the rural country side attended by a midwife of unknown skills (a guesstimate would place the rate at 50 maternal or child deaths per 1,000 births). Their supplies to implement safe delivery are extremely limited. This must change. The people of Haiti possess the utmost dignity, spirit and above all endurance imaginable and deserve the right to have safe birthing and prenatal care. 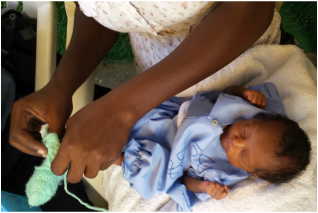 Midwife Training Program: a midwife education and training program exists in northern rural Haiti, the area which we serve. Women are to receive education, clinical instruction and certification by the Health Minister of the North in order to serve as a midwife. They are to be given supplies such as sterile gloves, soap, pads, umbilical ties etc. and are to verify that the mother has received tetanus vaccine, has had HIV testing and testing for syphilis (RPR). A record of their deliveries is to be presented to the Health Minister. The Problem: Currently, there are neither government funds nor NGO support for midwifery in the rural area south of Cap Haitien. Therefore, most of the above is non-existent — just a good idea. A major hurdle in finding support for them has been their own budget proposal suggesting that well over $100,000 is needed each year to serve all the midwives in that district. Completely impossible. What Can Be Done: Many years of experience in northern Haiti has made it clear that, because we cannot help everyone, it does not mean we cannot help someone. Because we are unable to fix everything it does not preclude fixing something. Our intent is to support midwife training in just two areas: Grison-Garde and Labruyere. Both areas are accessible from the clinic we serve and very familiar to our Haitian clinic physician (Dr. Maklin Eugene) and his associate Marcelin Pierre who coordinate the orphanage/school project. This will allow them to reach many dozens of midwives while bringing costs into an affordable range. Where will training take place? Who does the training? Who chooses the students? We emphasize that this effort is entirely in the hands of the people of Haiti at every level except funding. So you ask “isn’t that support just going to make the government less likely to offer aid?” Sad to say, 200 years of Haitian history tells us that government support will not reach the impoverished in rural Haiti regardless. Provide Birthing Kits: Rather than provide bulk (difficult to inventory and control) sterile gloves, soap, umbilical cord ties, plastic sheeting, hand sanitizer, sanitary supplies, newborn clothing and cap, receiving blanket, etc. we will offer individual birthing kits containing these items, which will be given to pregnant women whose pregnancy has been verified by either exam or pregnancy test. An additional supply of kits will be available from our coordinators or the prenatal clinic for midwives who offer a valid record of their previous delivery experience. These kits are being created by American volunteers and will cost the project only $3/kit for shipping to Haiti — a huge savings and a chance for volunteers to do some real good. Support Prenatal Clinics: The cost for receiving prenatal care in a clinic such as the one we support in Tovar (part of Grison-Garde) is huge: $12 U.S. Important tests and care are given, including HIV testing, test for syphilis (RPR), tetanus vaccine, prenatal vitamins and instruction about connecting with a midwife for delivery. Sounds OK, right? It seldom happens because those most in need are least likely to attend, the cost being prohibitive. We will raise funds to allow a woman to utilize the clinic without cost. Our coordinators will document patient visits. Training Sessions for Midwives: Midwives will come for periodic sessions conducted by approved midwife instructors and Haitian physicians and nurses. Salary will be provided for them as needed. Association with the Health Minister of the North: Our foundations — Robert Ford Haitian Orphanage & School Foundation and The Haiti Mission Foundation — are “partnered” with the Health Ministry of the North (Dr. Robert Jasmin) and are assured of his full encouragement and cooperation. This is to be a project both owned and directed by the people of rural Haiti. Funding: Donations of support will be given to the Robert Ford Haitian Foundation. Please specify that your donation should be directed for this midwife project.